From May 4TH through May 31ST, participants can enter the challenge by uploading 15-30 second videos to Care Bears Share, and using hashtag #ShareYourCare. 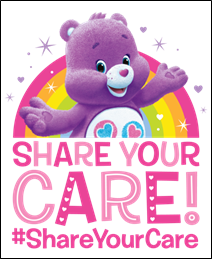 Videos should identify how Care Bears fans share their care, based on four themes: Love, Care, Share and Help. Here is an example of New York – Sharing Their Care.